The commandos and marines come together under a new leadership, which reinforces these Special Operation Forces (SOF), Defense announces Monday. According to the ministry, the capacity of the SOF is now too fragmented, while the work of these elite units is becoming increasingly important. 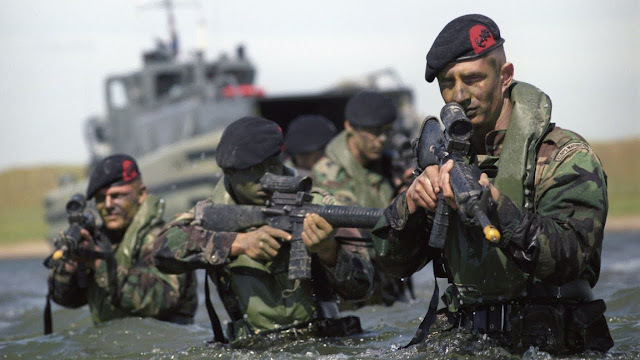 The special forces will come under the command of Netherlands Special Operations Command (NLD SOCOM) which will be established on Wednesday. The organization will take care of the planning, management, execution and evaluation of the work of these special units. For example, by placing the SOF under one command, joint training should become easier. Also faster support of for example helicopters can be arranged. The new command must be operational by 2020 at the latest. Marines and commandos have been used frequently during missions over the last decades. They perform special operations in small units in enemy territory. This happened during the mission in Mali, for example. In Iraq, Dutch commanders are currently training their Iraqi colleagues. This is the "hotness" now...to setup Special Operations Commands...but I wonder. They traded one bureaucracy for another. They chafed under control of Big Army, Navy..whatever. Will they eventually chafe under a specific Special Operations Command? Additionally I have yet to see how these Special Ops Units (of all stripes) will fit into the new focus on peer vs peer conflict. Yeah. I can see a Ranger raid, MARSOC raid but are the SEALs and Special Forces or USAF Special Ops setup to conduct raids on installations? Does anyone do long range patrol? What about the other special ops missions like deep recon? How much of this has been rendered obsolete by UAV, Sats or local indigenous personnel/spies? I said all that to say this. We might have seen the high water mark for Special Ops. The war on terror is winding down without victory or even a satisfactory "other" solution. We went all in on Special Ops and it wasn't the war winner some thought it would be. Which brings me back to this move by the Netherlands. Is it a conventional wisdom move executed too late?